Sen. Chris Murphy, a Democrat from Connecticut, said that a compromise had been reached. Votes would be held on whether to ban people on the government's terrorist watch list from obtaining gun licenses and whether to expand background checks to gun shows and internet sales, he added. "We did not have that commitment when we started today," Murphy said. The nonstop series of speeches stretched 14 hours and 50 minutes. It followed the shooting massacre at a gay nightclub in Orlando. "I've had enough. I’ve had enough of the ongoing slaughter of innocents, and I’ve had enough of inaction in this body," Murphy said during the filibuster which he launched around 11:21 a.m. Wednesday. He vowed to remain on the Senate floor "until we get some signal, some sign that we can come together." 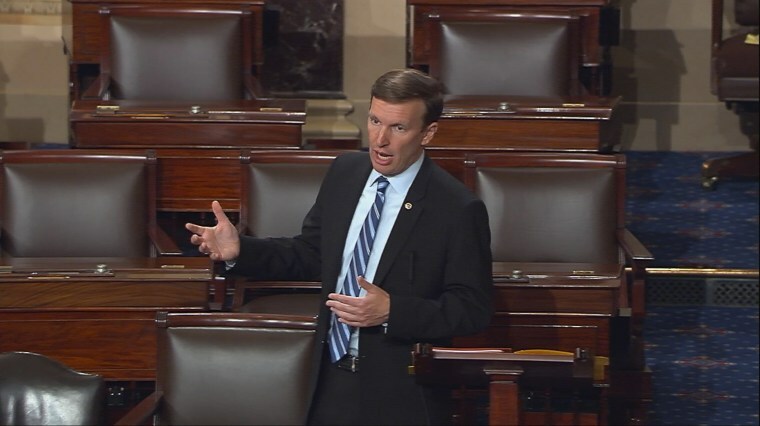 Related: Where Does Chris Murphy's Filibuster Rank? By Senate rules, Murphy had to stand at his desk to maintain control of the floor. When asked by another senator how he was feeling just before 7:30 p.m., Murphy said rehabilitation from a back injury in his 20s had helped him build up endurance. Murphy said he wants Congress to enact tighter restrictions to prevent those with serious criminal histories, those deemed mentally incompetent, and those on terrorism watch lists from obtaining firearms. He began the filibuster three days after a gunman who had been investigated by the FBI — the agency says it found no credible threat — opened fire at Orlando's Pulse nightclub, killing 49 people in the worst mass shooting in modern American history. The weapons carried by the gunman, Omar Mateen, were legally purchased. He bought the Sig Sauer MCX semi-automatic rifle and a handgun in the week before the massacre, officials said. "What unites all of these shootings, from Littleton to Aurora, to Newtown, to Blacksburg to Orlando, is that the weapon of choice in every case is a gun — often a very powerful gun, an AR-15 or an AR-15-style gun that was designed for the military, for law enforcement to kill as many people as quickly as possible,” Murphy said. Murphy’s state of Connecticut saw the mass killing of 20 school children and six staffers at Sandy Hook Elementary School in Newtown on Dec. 14, 2012. Sunday's shooting has revived calls from Democrats pushing for gun control legislation. The National Rifle Association is fiercely opposed to what its leaders called a series of anti-gun bills and amendments, and warned its members Wednesday that the measures are a threat to the right to own firearms. Presumptive Republican presidential nominee Donald Trump, who has been endorsed by the NRA, told a crowd in Georgia: "I'm going to save your Second Amendment." Murphy said Senate leadership agreed to allow a vote on legislation from Sen. Dianne Feinstein, D-Calif., that would let the government bar sales of guns and explosives to people it suspects of being terrorists. Feinstein offered the amendment in December, a day after an extremist couple killed 14 people in San Bernardino, California, but the Republican-run Senate rejected the proposal on a near party-line vote. He said the compromise also will allow a vote on an amendment to expand background checks. Sen. Bob Casey, who represents Pennsylvania, spoke at around 12:30 a.m. Thursday, called on legislators to allow the votes. "At least put your hand up for a vote that will begin, just begin the long journey to rectify a substantial national problem that takes 33,000 people every year," Casey said. "All we’re asking for is a start." As Murphy wrapped up the filibuster in the early hours of Thursday, he told the story of Sandy Hook student Dylan Hockley and his teacher Anne Marie Murphy, who died trying to protect him. "It doesn’t take courage to stand here on the floor of the U.S. Senate… It takes courage to look into the eye of a shooter and instead of running wrapping your arms around a 6-year-old boy and accepting death," Murphy said. "If Ann-Marie Murphy could do that then ask yourself — what can you do to make sure that Orlando or Sandy Hook never, ever happens again." The Senate is due back in session at 10 a.m. ET on Thursday. Emily Gaffney and The Associated Press contributed.